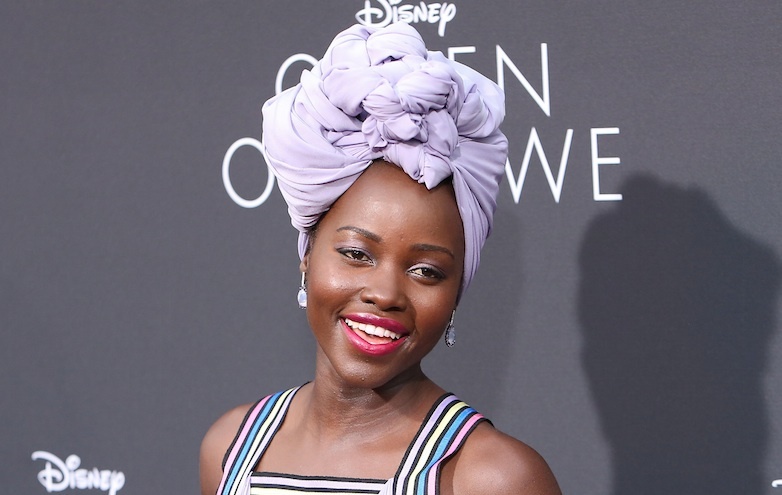 Among all the actresses who frequently turn heads with their stylish star-power, Lupita Nyong’o is beyond. Seriously, like how is it even possible to look so consistently flawless?! Take for example, her stunning metallic eye makeup for the premiere of Queen of Katwe in Johannesburg. The look was created by makeup artist Nick Barose, and as you can see it’s very intricate. PeopleStyle let us know that the dots above her eyes are actually gold eyeshadow mixed with a gold pigment and applied with an eyeliner brush to create “liquid gold,” — simple, yet striking. We love that the look has a historical connection to the city of the premiere. And here’s a selfie of Nyong’o with her trusty makeup artist. As well as looking beautiful, Nyong’o is absolutely killing it on the international acting stage right now. Besides starring in Queen of Katwe, she’s in the next Star Wars: Episode VIII, and Black Panther! Aaaaand it’s fair to say that blockbusters don’t get bigger than that. We can’t wait to see her in her upcoming films, and we’ll be on the lookout for more of her utterly inspired looks.